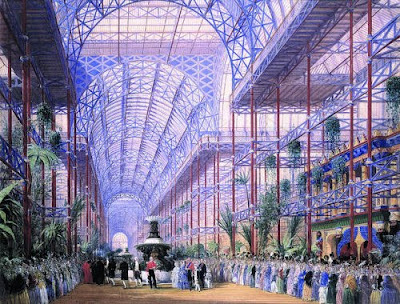 It was May 1, 1851 when the first World's fair under the title "Great Exhibition of the Works of Industry of All Nations" was inaugurated in Crystal Palace in Hyde Park. Half a million people gathered there coming with one thousand state carriages and two thousand cabs from all over London - in the end more than six million people will visit the exhibition between May 1, to October 15. Fig.1. Lithograph by Joseph Nash depicting the exhibition's opening on May 1, 1851 with the royal family presiding, found by D. Orr on "love in the time of Chasmosaurs." 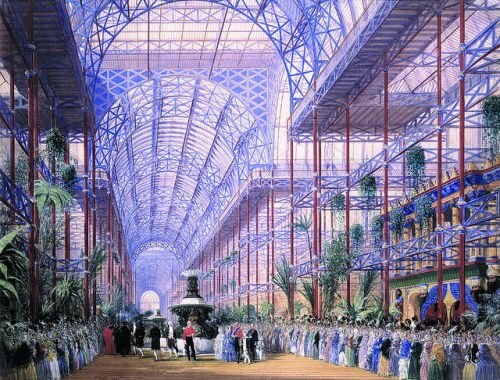 Inside Crystal Palace - inspired and realized as sort of gigantic greenhouse - the "very best that human ingenuity and cultivated art and science could inspire" was displayed to the curious public. One of the organizer and judge of the spectacle was 47 years old famous anatomist and palaeontologist Richard Owen, very busy supervising the zoological and botanical divisions, entertaining foreign guests and awarding medals to the most spectacular curiosities. In the crowds visiting the World's fair in the six months there was another self-educated palaeontologist present - 61 years old Gideon Mantell, who had made his way to London despite the pain caused by a severe accident on a carriage ten years earlier. "The effect is indescribably overpowering. I cannot express the effect it has left upon my mind; nothing can prepare you for this." "I managed to squeeze into the back and least crowded compartments of minerals and with some difficulty ascended the gallery overlooking the transept to look down on the sea of heads underneath." The World's fair closed October 15, 1851. It was decided to relocate and reconstruct the Crystal Palace on Sydenham Hill in suburb southern London and a part of the planned theme park should be devoted to geology and palaeontology. In summer 1852 Mantell, discoverer of many fossil bones of the British prehistoric reptiles, was contacted by the Crystal Palace Company to oversee an ambitious project: it was planned that a "Geological Court be constructed containing a collection of full-sized models of the Animals and plants of certain geological periods, and that Dr. Mantell be requested to superintend the formation of that collection." Here was finally a chance to Mantell to present his discoveries to a large public, however he realized that his bad conditions would prevent him to finish the project - he refused. On 11, November of the same year Mantell died of an overdoses of opiates. 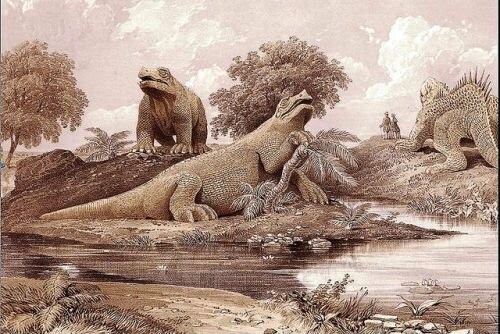 Under severe examination of Richard Owen soon the first models of all known giant lizard of the time - Ichthyosaurus, Plesiosaurus, pterodactyls and the dinosaurs Megalosaurus, Iguanodon and Hylacosaurus (today referred as Hylaeosaurus) were completed. Owen reconstructed the Iguanodon as large, quadruped rhinoceros, ignoring the discoveries of Mantell, who noted that the forelegs are smaller than the hind legs. Fig.2. Lithograph of the Crystal Palace dinosaurs (two Iguanodon and Hylacosaurus/Hylaeosaurus) as restored by Benjamin Waterhouse Hawkins in accordance with ideas derived from Richard Owen and Gideon Mantell (references unknown).